On Friday evening, a foreign bald eagle entered the Marco Island Nature Preserve & Bird Sanctuary and attacked a nest belonging to a female eagle named Calusa and her two eaglets. The attack comes less than a week after Paleo, Calusa’s partner, was found dead on the preserve due to an electrocution. FWC officers retrieve the fallen eaglets, who, despite the fall appear to be doing well. Photos by John Busch. According to witness Doreen Hertel, observers at the sanctuary called the authorities to report the incident. “It was unbelievable as we watched the eagle bringing it [the eaglets] down by the wing,” Hertel said. Officers from the Florida Fish and Wildlife Conservation Commission (FWC) arrived on the scene shortly thereafter. They were able to locate the two eaglets on the ground. The eaglets were then transported to the Conversancy of Southwest Florida for monitoring. Carl Way, chairman of the Marco Island Nature Preserve and Bird Sanctuary hands an FWC officer a box containing one of the eaglets. Jon Busch and his granddaughter Peyton look on. 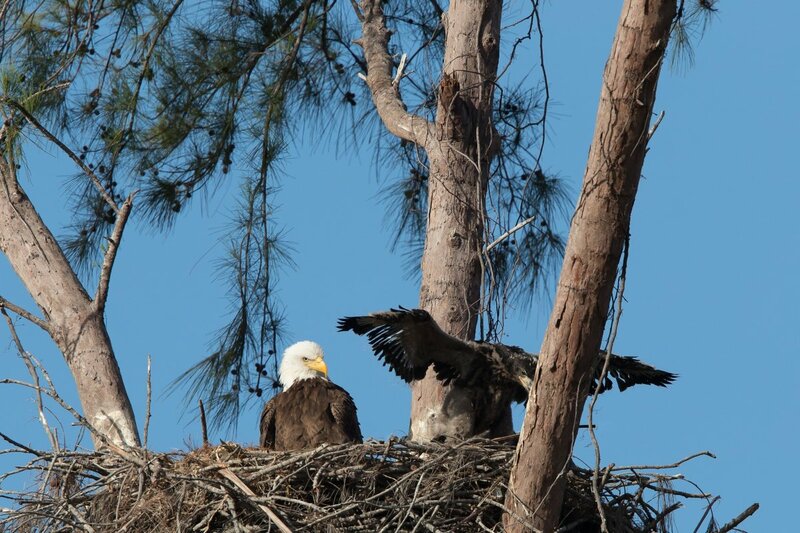 If you encounter a dead or injured eagle the FWC asks that you contact the FWC OLE Department at 888-404-3922. Please do not attempt to pick up the bird or take any of its parts (feathers, talons, etc.). This is prohibited under the Bald and Golden Eagle Protection Act and the Migratory Bird Treaty Act. Marco Island has one of the most sought after game fish, Snook. It can be found in the waters around Marco Island some weighing up to 15 to 30 pounds. 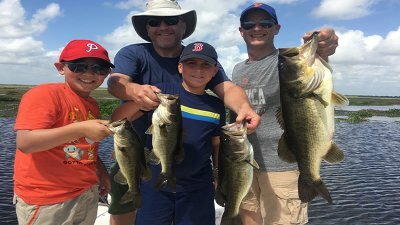 Marco Island (close to both Naples and 10,000 Islands) offers an amazing array of saltwater species for both Inshore and Offshore fishing. Marco Island is unsurpassed for its beauty and calm fishing waters. The calm, pristine tropical backwaters of Marco Island, Chokoloskee and 10,000 Islands are a secluded fishing paradise everyone should experience at least once. Fly fishing in the backcountry around Marco island is a world class experience that should not be missed. You will glide along the shallows in a state of the art boat, so swiftly, so stealthy- enjoying both nature and a fishing fiesta! Inshore fish for Spotted Trout, Redfish, Snook, Shark, Tarpon, Spanish and Cobia in the beautiful and calm Gulf of Mexico waters are most anglers choice.